If we are affected by someone’s suffering, we will remember it, which is one of the great gifts that we give to each other. A young man’s father died, and his local church, as we would expect, loved him well—invitations to dinner, a high priority on everyone’s prayer list, and warm e-mails, texts, and cards. After a week or two, the generous care began to taper off, also as we would expect. The few people who still asked the young man how he was doing stood out to him as unusually caring. The young man was stunned. He was changed. He was comforted and encouraged, and he committed to keep others on his heart long term. God’s premiere self-description is “the compassionate and gracious God” (Ex. 34:6 NIV). This means that both our pain and our prayers affect him, and he has us on his heart. He takes our burden on himself and remembers us. As we imitate our Father, we want to feel the burdens of others too. So we call, e-mail, track down the suffering at church. We have them on our heart, and we want them to know it. Say something. Do something. Remember. That is the basic idea. Yet the call to say something does not mean that everything we say is good and helpful. It’s important to know what not to say. Sometimes we may be tempted to respond to someone’s suffering with thoughtless platitudes. Here are three offenders. We have some odd ways of cheering each other up. The comment is accurate—everything could be worse. We suffer and then, along with the suffering, have a comforter who says it could be worse. Such a comment is utterly thoughtless. God himself would never say or sanction it. God does not compare our present suffering to anyone else’s or to worst-case scenarios. Ever. If we hear friends do this in their own suffering, it does not give us the right to chime in. Instead, it might be a time to warn them. If we make such comparisons, we might be tempted not to speak of the suffering from our hearts to the Lord because we would consider it whining, which it certainly is not. So even though things could be worse, that is never an appropriate thing to say to others or to let others say about their situation. God is not dismissive of our hardships, and neither should we be. Those platitudes are biblical in that God does teach us in our suffering, and he is working all things together for good (Rom. 8:28). We agree with C. S. Lewis when he writes that pain is God’s megaphone to arouse a deaf world. But these kinds of comments have hurt so many people; let’s agree that we will never say them. Such responses circumvent compassion. Will you have compassion if someone is being “taught a lesson”? Not likely. Such responses suggest that suffering is a solvable riddle. God has something specific in mind, and we have to guess what it is. Welcome to a cosmic game of Twenty Questions, and we’d better get the right answer soon; otherwise, the suffering will continue. Such responses suggest that we have done something to unleash the suffering. In our attempts to help, we can over-interpret suffering. We search for clues to God’s ways, as if suffering were a scavenger hunt. Get to the end, with the right answers, and God will take away the pain. Meanwhile, the quest for answers is misguided from the start and will end badly. Suffering is not an intellectual matter that needs answers; it is highly personal: Can I trust him? Does he hear? Suffering is a relational matter, and it is a time to speak honestly to the Lord and remember that the fullest revelation he gives of himself is through Jesus Christ, the suffering servant. Only when we look to Jesus can we know that God’s love and our suffering can coexist. This heads in a better direction; it is not quite a platitude. However, this common and kind comment reveals that we do not really know the person. Sufferers usually don’t know what they want or need, and they won’t call you. The comment is the equivalent of, “I’ve said something nice, now see ya later.” It gives no real thought to the sufferer’s needs and circumstances, and the suffering person knows it. Or (better) we could consider what needs to be done and do it. Wise friends buy more dog food, do the dishes, drop off a meal, cut the grass, babysit the kids, clean the house, give a ride to small group, drop off a note of encouragement and then another and another, help sort out medical bills, and so on. Any such acts of love and service make life easier for the suffering person. And a meal is never just a meal; maid service is never merely a timesaver for those served. These acts say to the sufferer, “I remember you”; “I think about you often”; “You are not forgotten”; “You are on my heart”; “I love you.” The time we give to creative strategizing is the power behind such acts. It is unmistakable love that mimics the strategic planning of the triune God’s rescue mission. He planned and acted even before we knew our real needs. The oddity of our clumsy and sometimes hurtful attempts to help is this: we have clear ideas from what has helped us in our suffering, but we do not adopt it when seeking to love others. We do not always speak to others in the way we would like to be spoken to. 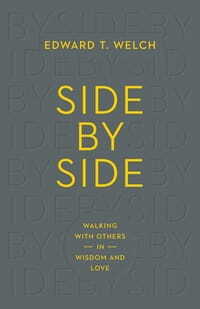 Taken from Side by Side: Walking with Others in Wisdom and Love, by Edward T. Welch. Used by permission of Crossway, a publishing ministry of Good News Publishers, Wheaton, Il 60187, www.crossway.org. Everyone needs help from time to time, especially in the midst of painful circumstances and difficult trials. In this short book, a highly respected biblical counselor and successful author offers practical guidance for all Christians—pastors and laypeople alike—who want to develop their “helping skills” when it comes to walking alongside hurting people. Written out of the conviction that friends are the best helpers, this accessible introduction to biblical counseling will equip believers to share their burdens with one another through gentle words of wisdom and kind acts of love.